Counselor to President Donald Trump, Kellyanne Conway, laid into Democratic 2020 election candidate Bernie Sanders on Tuesday, attacking the Vermont senator over his stance on abortion. Speaking with Fox News host Martha MacCallum, Conway criticized the idea of “late-term abortion,” which has become a favored talking point for pro-life campaigners and Republicans keen to paint the Democratic pro-choice platform as immoral. Late-term abortion is usually understood to mean those that take place between the 21st and 24th week of pregnancy, reported The Washington Post. Medical professionals generally avoid the “late-term” terminology, arguing it is imprecise, misleading, and could make people believe abortions regularly take place when a woman has already reached or passed a full-term pregnancy in the 37th week. Even President Donald Trump has misunderstood, or misrepresented, late abortions, claiming they amount to “executing” babies after birth. Earlier this week, his administration upped its abortion offensive with plans for a White House screening of the anti-abortion film Gosnell. The film revolved around Kermit Gosnell, a doctor prosecuted in 2013 for first-degree murder related to illegal late abortions. The 1973 Roe v. Wade Supreme Court decision made abortion a legal right across the country, up to the third trimester of pregnancy. The 1992 Planned Parenthood v. Casey Supreme Court ruling reaffirmed the right to abortion, but ruled that states may regulate from the point of fetal viability, around 24 weeks. A small number of abortions do occur after this in cases when a fetus is nonviabile or when there is a threat to the mother’s life, Politifact noted. Only 1.3 percent of abortions in the U.S. currently occur after 21 weeks, according to the Centers for Disease Control and Prevention. Conway claimed that non-partisan physicians have established that babies can feel pain at 20 weeks. This is a simplification of the research done into the complex issue, according to Factcheck.org, which is still under debate. But Conway said this is a significant problem. She slammed Sanders and Democrats for voting against the Born Alive Survivor Protection Act—a Republican bill which would require the care of infants born after failed abortions and could send doctors to prison if they do not comply. However, those opposed to the legislation argue it is dangerous to criminalize doctors and that laws already exist to protect an infant in this unlikely scenario. 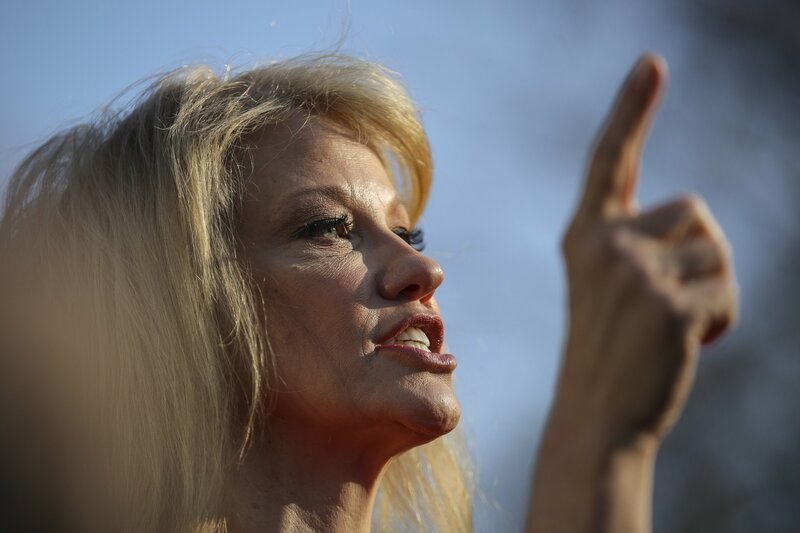 Kellyanne Conway speaks to reporters outside of the White House, March 25, 2019 in Washington, D.C.